Kitchen cabinetry comes in different options, giving you the flexibility to match it to the theme of your kitchen décor. Kitchen cabinets are probably the most cost-intensive component of your kitchen, thus, while planning your kitchen layout you need to factor in the style of your cabinets to optimize the space you have. A stock kitchen cabinet is a big cost saving on a customised kitchen cabinet. The types of kitchen cabinets can be broadly divided into custom, semi-custom and stock kitchen cabinets. Cabinets can also be built at site. The stock kitchen cabinet is produced on a assembly line in a factory to standard specifications and comes pre-assembled or ready to assemble. You can literally buy them off the shelf at large home centres. With some, you can choose the finish and hardware/accessories but by and large, they are ready to use. Stock kitchen cabinets are usually sized in three-inch width increments with matching spacers, filler boards etc. so that gaps can be filled where necessary. The regular base cabinets are 34.5 inches high and those with desks or dining surfaces are 28.5 inches high. The wall-cabinet type comes in sizes of 30 inches, 36 inches and 42 inches. Stock kitchen cabinets are constructed as frameless or with face frame. The face frame type has a frame that runs across the cabinet’s box face and is visible when the cabinet is closed. 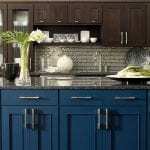 The cabinet doors might have recessed or raised panels with trims or with framed glass panel. The frameless cabinets have doors covering the entire front of the cabinet box, usually without moulding or trim with hidden hinges. These look quite sleek and trendy. * Go for full extension drawer slides so that you can access the entire depth of the drawer. You can get cabinets with drawer closing mechanisms that gradually pull the drawers closed. The main advantage with stock kitchen cabinets is that it is cost-effective, although your choice with the wood and styles is limited. Since these are mass-produced, you get the price benefit so that compared to a custom or semi-custom kitchen cabinet you only incur a third of the cost when you buy stock kitchen cabinets. Another benefit is quick delivery as these come ready to fit and use. When in stock, you can usually buy them on a cash and carry basis. The ready to assemble open frame and pre-assembled kitchen cabinets are generally available in stock at the larger stores. Most come with a melamine finish, made of engineered wood with steel sided drawers and are quite economical. If you enjoy doing it yourself, stock kitchen cabinets are easy to buy and install, but most stores also offer you the option of getting it professionally installed for a nominal charge. Semi-custom kitchen cabinets give you the freedom to make modifications in the design of your cabinets so that they suit your needs. While some people prefer to opt for stock cabinets, some go for semi-custom kitchen cabinets. Semi-custom cabinets can take up to six weeks to set up, depending on what you order. Quite a few home centres carry displays of semi-custom cabinets where the customer can consult with the staff designers and come up with a plan based on their needs. Semi-custom cabinetry means better craftsmanship and material quality compared with in stock units and the customer can choose from different styles and finishes, add extra features like plate racks, corner cupboards, pantries, sliding shelves. Most semi-custom cabinets are available with a lot of choice, with sides usually made of engineered wood with solid doors. The material used is oak, maple, hickory and cherry all of which are the common woods used to make cabinets. 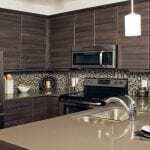 You can also choose veneer over plywood to get the specific wood look you want without the high cost. You get open or framed cabinets with the drawers usually made from solid wood. Although semi-custom cabinets are built in standard sizes, some manufacturers let you specify your size. The dimensions of the standard base cabinets are generally 34.5 high and 24 inches deep. The sides are 0.75 inches thick. The wall cabinet style is 30 inches high and 12 inches deep, unless it goes over a range hood or refrigerator. Depending on the manufacturer you can probably customize your semi-custom kitchen cabinet by decreasing the depth of the base or wall cabinet. In case the cabinet is not a perfect fit, trim work or filler is used to make up the cabinet’s measurements. You can easily differentiate semi-custom from stock cabinetry based on the construction, flexibility it allows and the design of your kitchen cabinet layout. The experience of the designer who designs your cabinet layout also counts. Attention to detail is usually more with semi-custom cabinets with the designer opting for solid wood rather than plywood with veneer since solid wood centre panels stain better than veneer, to look as good as the door frame and cabinet panels. Since semi-custom kitchen cabinetry means more flexibility for you as well as the designer, you can get exactly the features you need probably within the budget you have set aside.